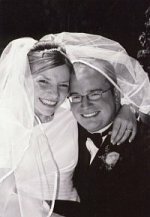 Megan and I celebrated our fifth anniversary yesterday. It's amazing to me that we've been married for only five years, yet we've gone through so many wonderful experiences together. One day when I was in college, I received a letter from my Dad in which he listed several of the girls he dated before he met my Mom. Reading his short descriptions, I gather he would have been a different man had he married any of them. It was clear that he knew when he found a good match in my Mother. When I met Megan in 2001, things unfolded the same way. My life seemed to be crumbling like the World Trade Center, and from within my thick dust cloud of emotions I found it hard to trust that Megan was...well, real. She helped lift me out of my trials and I hesitated to ask her to marry me because I was sure that no positive experience that significant could last a lifetime. And of course, it has lasted. Thank you, Megan, for marrying me. I love you. Happy Anniversary! You guys are too cute! I am happy for you! Thanks, everyone, for celebrating with us! !